Techlicious extends its congratulations to Pacific Northwest College of Art student John Summerson. He’s been officially named the first ever winner of LG’s “The Art of the Pixel” video contest. His entry, titled Painting For Life, beat out nearly 300 others from students from around the country, earning him $10,000 in cash, a free trip to New York City and a $50,000 grant for his school. 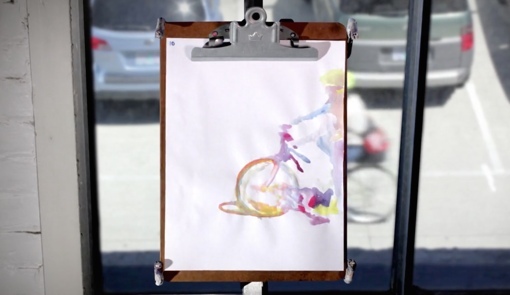 Painting from Life expertly mixes video, music and stop-motion watercolor paintings. The 1 minute, 30 second piece starts in Summerson’s studio as he mixes paints. It then transitions over to the artist’s window, where passing pedestrians and bikers are turned into vivid stop-motion watercolor paintings. The colors in the video are beautiful and vivid, and the production is flawless. Summerson’s Painting from Life was recorded in 4K resolution, so of course, the best way to watch it is on your own Ultra HD 4K television. Of course, you can be forgiven for holding off on buying one of LG’s models for the time being, gorgeous though they may be. The company’s 65” 4K Ultra HDTV will set you back a whopping $9,999 when its released in October. LG’s larger 77” model, meanwhile, will sock your bank account for $24,999 this November. You can take a look at Summerson’s beautiful video by the LG Supports the Arts website. And while you’re there, be sure to take a look at all the truly worthy videos from the runners up. They all look terrific whether you have a 4K Ultra HD television or not.